This recipe roundup features easy-to-make, healthy grilling recipes that are perfect for summer. I’ve also included recommendations for where to buy high-quality, organic meat and seafood, with special savings that are exclusive to EEE readers! The outdoor grill is one of the best tools for making summer dinners. It is super simple to use and cooks full meals in a flash. Grilling food also has a great nutritional advantage, because excess fat melts and drips off of meat as you grill it. Use these delicious, healthy grilling recipes as inspiration for your meals all summer long. If you want to make any of these recipes in the absence of warm weather, just use a grill pan in your kitchen instead! However, it can be difficult to find organic, grass-fed meat, so allow me to introduce you to ButcherBox! ButcherBox is a popular monthly meat delivery service that delivers high quality, antibiotic- and hormone-free cuts directly to your door. Their meat selection includes 100% grass-fed and grass-finished beef, free-range chicken and heritage breed pork. The meat arrives frozen and individually vacuum-packed in an insulated, eco-friendly box. Lastly, the price works out to less than $6 per meal and the shipping is always free! If you are having a hard time finding healthy, tasty meat near you – or if you want to avoid shopping and traffic AND get top-quality meat delivered right to your door while you’re at it – then you have to try ButcherBox. If you prefer seafood delivery, my favorite source is is Vital Choice. Vital Choice is an online retailer that sells wild-caught, sustainably-harvested seafood. All of the seafood sold there is certified sustainable either by MSC, the State of Alaska or Monterey Bay Aquarium’s SeafoodWatch program. If you want to try out Vital Choice, click here to get 10% off your first order with the discount code VCAF10! To learn more about my favorite places to get beef, poultry and seafood, check out this detailed post I wrote: The Best Sources for Grass-Fed & Organic Meat Delivery. This recipe for Garlic Butter Grilled Steak & Shrimp from Café Delights makes a gourmet steak dinner that tastes like something out of a restaurant. Ready to eat in less than 15 minutes! 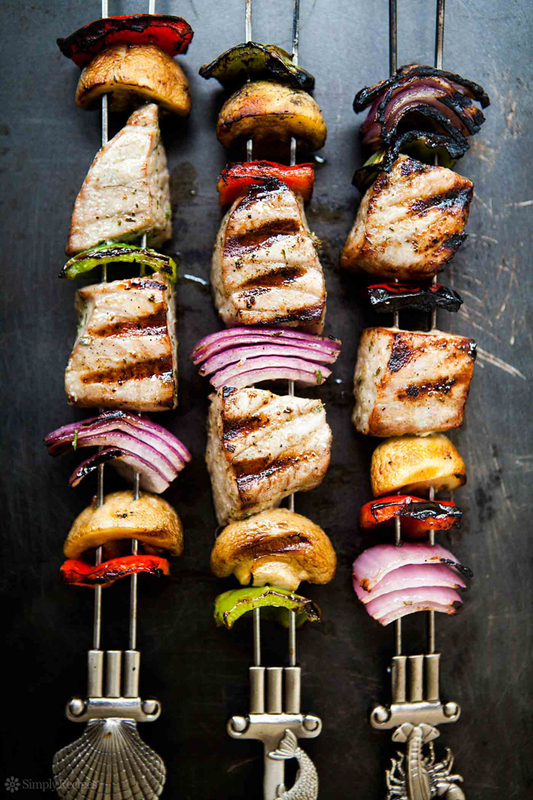 These Grilled Tuna Kebabs from Simply Recipes feature skewers of fresh marinated tuna, onions, bell peppers, and mushrooms. Feel free to use any type of meaty fish for these kabobs. These Grilled Portobello Mushrooms from Well Plated are ideal for vegetarians and Meatless Mondays. You won’t even miss the meat! This Grilled Chicken Strawberry Poppyseed Salad from How Sweet Eats is fresh, satisfying (without being heavy) and packed with flavor. Perfect for packing for lunch! These Rockin’ Chimichurri Steak Tacos from Pinch of Yum are made with spicy marinated grilled steak, chimichurri sauce and any toppings you like. Perfect for summer BBQs and entertaining! This Grilled Marinated Thai Chicken (Gai Yang) from RecipeTin Eats brings classic Thai street food right to your kitchen table. Made using the most delicious marinade! These Green Goddess Veggie Burgers from Simply Recipes are a great alternative to regular beef burgers. These burgers feature meat-free patties drizzled with a creamy, dreamy Green Goddess sauce over top. What are your favorite healthy grilling recipes? Let me know in the comments below! I love this post!! I have heard so many good things about Butcher Box! My best friend’s husband swears by it, so I gotta try it soon! Also, my favorite grilling recipe is grilled Mexican corn on the cob….so freakin good!! Hi Leslie! Thank you! Yes you must try ButcherBox, I love their service and meat so much. Oh grilled Mexican corn is so delicious, I put a ton of Cotija cheese on mine whenever I make it, haha! I’ve never heard of Butcher Box, but it sounds like something I would definitely love, because I prefer, grass-fed and hormone-free meats, too! All of your grilled dishes look spectacular – I love anything grilled, especially veggies!